One hundred years ago today, on November 11th 1918, the First World War came to an end. It is a day we commemorate every year with a couple minutes’ silence, as we fondly remember all those who gave their lives in combat, and who fought for peace at a time when it seemed so out of reach. Everyone has stories about life in the Great War, many of them nowadays being told by descendants of those fortunate enough to survive; I, for instance, had a great-grandfather who served in the trenches, and was mere centimetres away from being killed by enemy gunfire, spared only because he bent down to retrieve something while his best friend took the bullet right next to him. 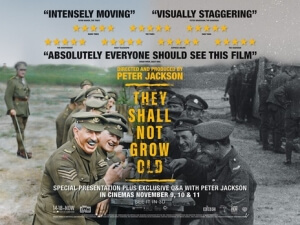 These stories are what Peter Jackson has paid emotional tribute to in his new commemorative documentary They Shall Not Grow Old, a film that has gained a great deal of attention for its revolutionary strategy of presenting, for the very first time, colourised footage from the First World War. Jackson even goes several steps further, by slowing down the sped-up footage, adding sound effects and dubbed-in voices, and for those fortunate enough to see it on the big screen is even presented in 3D, all of which helps to create an experience of the War that is honestly unlike any that has come before it. To tell the story of the First World War in this unique way, Jackson had access to well over 600 hours of footage and audio from the archives of the Imperial War Museum, including several interviews across time of former soldiers recounting their own experiences whilst on duty (they act as narrators whilst the footage plays), and managed to find a way to use modern computer techniques to smoothen the grainier look, slow the footage down to a less jumpy frame rate, and of course painstakingly give each and every frame an array of realistic colours that covered everything from the soldiers’ uniforms to the grubbiest pile of mud in the trenches. He even recruited forensic lip readers to try and analyse what the soldiers might have been saying in that pre-sound footage, then having actors come in and record lines that sync up almost perfectly to the actual images on the screen. It is all nothing short of amazing, a true testament to the craft of archival filmmaking and a technological achievement by a filmmaker who has proven time and time again to be a major leading force in today’s effects-heavy blockbuster world. The footage he has brought to life here, much of it unseen by members of the public until now, gives viewers a stunningly real look through the mirror into this dark and unforgiving time in history, with the added sound effects and dubbed voices especially giving it a truly 3D feel beyond even the plastic glasses; it transports you right to the front line in ways that many other wartime films, television series and documentaries haven’t managed to do as effectively. You truly feel like you are right there with all those soldiers, enduring all the gunfire and landmine explosions – the latter of which is stunning to watch, especially when restored in colour – while also experiencing all the casualties going on around them (there are multiple images of dead bodies, many of them rotting and attracting rodents) that are upsetting but brutally honest. Jackson has made it clear that his film is not a story of the War itself, but rather an account of what life was like whilst serving in it, as told by the very people who lived through it. All of the perspectives you hear in the multiple narrations give different but alarmingly similar accounts, such as how many of them were at least fifteen years old when they signed up, the gruelling conditions of the trenches they were assigned to, and in a bittersweet conclusion how they weren’t exactly given a hero’s welcome upon returning after the War ended. Together, they help you form a picture in your head about how life for them must have looked like beyond the footage you’re actually seeing, as there are things that the former soldiers talk about that no footage apparently exists of, such as the fiery assaults on the German army or what it must have actually been like to storm No Man’s Land whilst facing enemy fire at every angle. In that regard, it is a deeply personal film that really gives an honest insight into the War from the people who were actually there, and all the things that you hear them talk about, whether it’s witnessing close friends get killed or suffering grave injuries in the line of fire, also make it a very emotional one as you feel every single soldier’s pain, both on the outside and the inside. But what it truly remarkable is how the film shows, even when faced with the grimmest of odds and stuck in the least favourable positions, there was a strong sense of optimism amongst the soldiers all throughout the war. A lot of the footage shows them laughing and smiling towards the camera, whether they’re in the trenches or sat down at a table for a meal, and keeping spirits alive by playing instruments, mucking around with other soldiers, having regular sports days including tug of war and rugby, and in one remarkable section even showing kindness to some of the captured German soldiers, many of them as youthful as some of the British corporals. What this film is remarkable at showcasing is the kindred spirit that remained active within the troops, even when serving in one of the bleakest conflicts in all of history, and the feeling that even though most of them won’t make it out alive there is a fighting passion in them to stay positive and keep the British end up, no matter what happens. That is what I feel to be the most inspiring thing about They Shall Not Grow Old, that even one hundred years on from its end there is still evidence that our soldiers, be they fallen or standing, had a smile on their faces during the First World War, a sentiment that none of us should ever forget, even as we remember them today. They Shall Not Grow Old is a remarkable technical achievement that sees director Peter Jackson restore old footage from the First World War in magnificent ways that have never been seen before, and creates an honest and emotional testament to the soldiers’ undying optimism, even when faced with overwhelming odds in this dark and unforgiving time. They Shall Not Grow Old will be broadcast on BBC Two on Sunday 11th November 2018 at 9:30pm.